Motherwell's Peter Hartley celebrates his goal to make it 2-0. Motherwell manager Stephen Robinson believes his side have a "great chance" of beating Rangers in the Betfred League Cup semi-final next month. 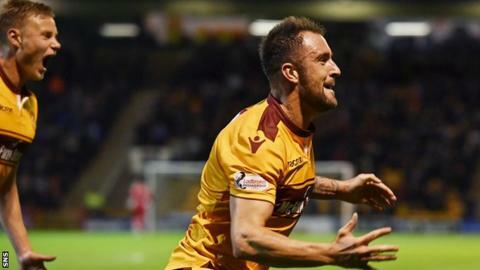 The Fir Park side saw off last season's runners-up Aberdeen with a Louis Moult double and a Peter Hartley header giving them a 3-0 win. "They are a big club with some super players and Pedro (Caixinha) is starting to turn the whole place around," Robinson told BBC Scotland. "But we'll worry about that later." Two goalkeeping errors from the usually reliable Joe Lewis helped Motherwell on their way. However, Aberdeen never got going and Motherwell could have extended their lead before Moult's goal, with Hartley's effort cleared off the line and Allan Campbell's shot hitting both posts. "We got that little break and we didn't look back after that," said Robinson. "Moulty's second goal epitomised everything about us. He didn't give up on it, he chased it down and that's the mark of his finishing capabilities. "I thought we could have had a couple more - Allan Campbell hit the post and Moulty had a couple of half chances. "We have a good team when they work very hard. If they don't work hard they won't be a good team - it's as simple as that." Aberdeen manager Derek McInnes felt Motherwell had "the best player on the park" in Moult, a man he had tried to sign during the summer. McInnes said: "I'm not shocked about what we got from Motherwell. I knew exactly the type of game it was going to be. They play quick football, we've got to be ready for it. "The first one came out of nothing. We should have dealt with it better before it came into the box, but it was a mistake by big Joe. It gave them impetus. "Hartley's header - I think Joe should save that one as well. "There was plenty of effort but I think the team that was more aggressive and showed a better intent to the game won the tie and deservedly got through. Our delivery into the box was poor. The whole thing was unconvincing. "I know my players; there's an honesty about them, they are hurting." Aberdeen return to Fir Park on Sunday in the Scottish Premiership, and McInnes says his team need to be more aggressive in order to avoid another defeat. "The only way you feel better about yourselves is if you win the next game," he said. "We've got to defend better, we've got to be more aggressive, and hopefully we can deal with certain players better."